One of the distinctives of CHA is our view of the gospel. The picture to the left captures this statement. 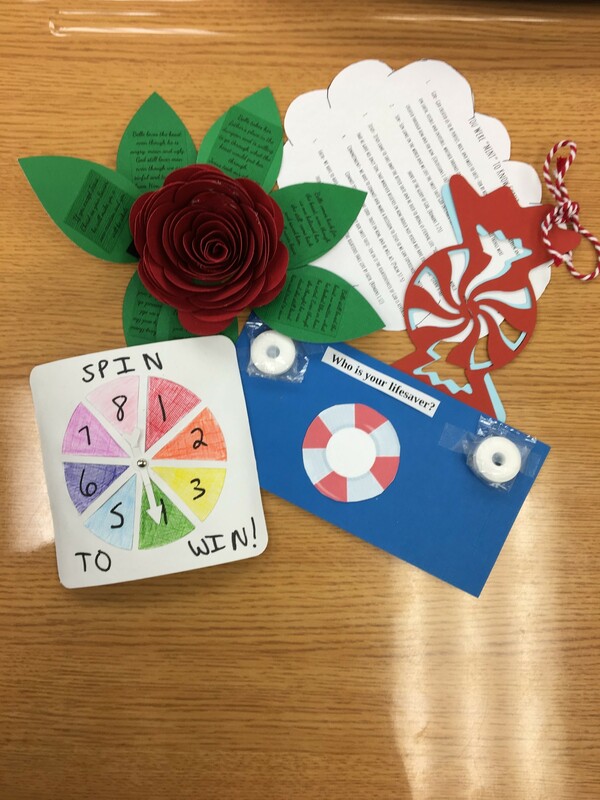 In Mrs. Huff’s eighth grade girls Bible class, students create their own tract to intentionally share with their friends. They plan a party or a unique way of sharing the tracts with their friends. For example, the paper rose has detachable petals. Each petal is numbered on the back. The petals are related to the movie, Beauty and the Beast and tie together the gospel message. The girls wanted to host a party and watch the movie and then use the rose to share the gospel with their friends. How creative! What I love most about this is not just the originality but also the intentional focus on God’s commandment for us to go and make disciples (Matthew 28:18-20). Research has shown that very few Christians will ever share their faith with someone else. Barna Research reported that only 64% of evangelical Christians felt that it was their responsibility to share. Throughout the grade levels at CHA, students are taught a variety of methods for presenting the gospel to others. This training begins in Pre-K. In the secondary, students are taken off-campus and engage the culture through various experiences. With this in mind, I would like to encourage you to attend this year’s banquet and intentionally invite someone to come with you. How will others hear about the great things God is doing at CHA if no one tells them? I am so thankful for those who have already chosen to sponsor tables for this year’s banquet. This banquet is CHA’s largest school-wide event which highlights the mission and vision of our school. Prospective families are free. Tickets are $35. Online registration is available here. I am so grateful that God is intentional. He foreknew us before time began. He has made Himself known to us so that we may live with intentionality for His glory and to make Him known.